Despite South Africa getting an early warning of India’s lethal wrist spinning duo in Durban, the hosts’ struggles continued in Centurion as the leggies claimed an eight-wicket haul to round up a pathetic SA for 118 runs. 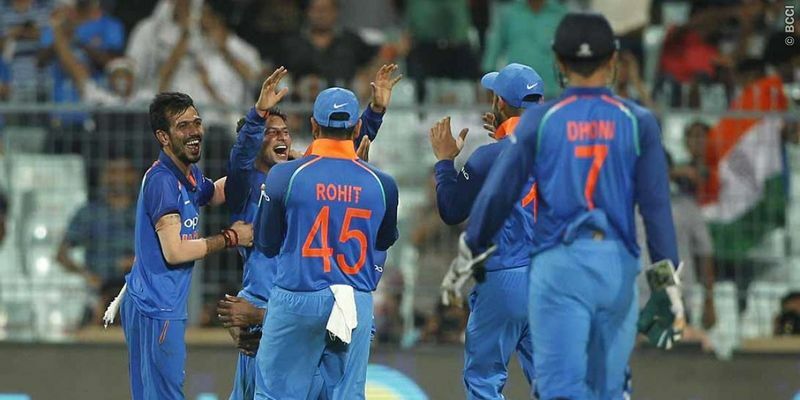 In reply, India reached the score in 21 overs with nine wickets in hand. Brief Scores: South Africa 118 (JP Duminy 25, Khaya Zondo 25; Yuzvendra Chahal 5/22, Kuldeep Yadav 3/20) lost to India 119/1 ( Shikhar Dhawan 51, Virat Kohli 46; Kagiso Rabada 1/24) by 9 wickets. After a terrible batting display in the first ODI saw the hosts crumbling like a house of cards in Durban, they didn’t appear to have learned any lesson whatsoever from it. As soon as the reliable Hashim Amla was seen returning to the pavilion in the 10th over from a Bhuvneshwar Kumar delivery, the rest followed suit. While Faf du Plessis’ determined batting display had kept things interesting to some extent in the last game, Markram struggled miserably to fill his shoes as SA lost three wickets at the 51-run mark. After an out-of-form Quinton de Kock gave away his catch to Hardik Pandya three overs later, the skipper followed him on the very next ball. Kuldeep Yadav, who had taken out the dangerous David Miller last game limiting him to just seven runs, got him for a duck this time as his outside edge was caught by Rahane. At the halfway line, South Africa was looking at the precarious scoreline of 95-4. The onslaught had taken a break for 13 overs in between with Duminy and Khaya Zondo, trying to keep things intact desperately. However, the pressure was for too much for an inexperienced Zondo, who, in an attempt to relieve it with a slog sweep in a deliciously tossed delivery by Yuzvendra Chahal, gave his catch to Pandya at mid-wicket. The score read 99/5 and the flurry of dismissals started again. Duminy was caught plumb on his front pad two overs later and Chris Morris, who had forged a timely 74-run partnership with du Plessis last game to take SA’s total over 200, was out of ideas now with Kagiso Rabada on the other end. And before he could so much as breathe, Rabada was dismissed by Chahal’s googly. With the team reduced to 110-7 now, even Morris could nothing about it. It was just a matter of time before the hosts were wrapped up and the three wickets fell one after other in the next four overs adding just eight more runs to the total. It was an easy task for the opening pair of Rohit Sharma and Shikhar Dhawan yet again with the asking rate less than three. However, it did not stop Rohit form taking the highway as the right-handed batsman took Morne Morkel to the stand with yet another humongous six in the first over this time. His adventurous run came to an early halt as his mistimed pull off Rabada’s delivery was caught by Morkel at fine-leg. With India reduced to 26/1, skipper Kohli came to the crease well aware of the fact that another century was not possible in this game with such a cramped target. While their well-settled partnership had ended prematurely last game through a cheap run-out, both Dhawan and Kohli ensured it did not repeat the same again. Dhawan, who fell short of a fifty in the last game by 15 runs, finally got it this time in 50 balls that included nine classy boundaries. India chased the 119-run target in 21 overs with a lunch break comically interrupting the game for 40 minutes, when they had just two runs left to chase.